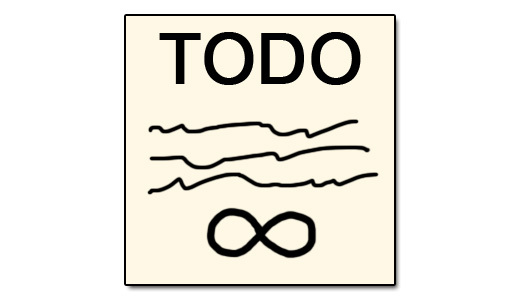 Grey Alien Games » Blog Archive » How do you manage your endless task list? This entry was posted on Friday, January 1st, 2016 at 7:16 pm and is filed under Organisational Tips. You can follow any responses to this entry through the RSS 2.0 feed. Both comments and pings are currently closed. Hi Oliver, yeah it’s simple and seems to be working so far. As for goals, I set myself annual business and personal goals and pin them on my noticeboard so I see them everyday, then work towards them. As for project management, yeah I have another page on the spreadsheet with a coarser overview than my detailed task list (which also has time estimates on it). I always keep stuff like project management digital so I can change it easily. I used to use a paper notepad to make notes as I was coding, like of things I just thought of and should do later, and sometimes to plan things out in more detail. But these days I tend to do all that in (Windows) Notepad as I guess I can type faster and clearer and edit my notes. It’s simple, Free but yet Very Powerfull! I like to keep things local and simple as well, but my system is based on OneNote. I used to have multiple spreadsheets and text files but I like having everything in one program. I have one notebook section for projects, one page per project where I keep the tasks and notes together. I review it regularly and plan out each day on paper. I divide my time into free days, focus days and buffer days. Free days are just work free. Focus days are days where I focus on just one or two big tasks. I try to spend those days in the zone. Buffer days are for lots of small admin tasks, planning and learning new stuff. That sounds like a good system Oliver. I’ve heard about OneNote too, in fact I think my wife uses it!